If anyone says that you waist too much time online, don't show them this post. Some people talk to their plants, as if they were people, to encourage them to grow and be healthy. It's unknown if it actually works for the plant but it may work to cure loneliness and boredom for the gardener. When I started this blog, I read something about how a blog is like a garden. If you tend to it and water it, it will grow nicely. Well now I am literally putting the garden and the blog together in hopes that the Eat Salem audience can watch and encourage my actual garden to grow. One of the basil plants got off to a late start and is finally starting to leaf out. I wasn't sure if this one was going to survive at first, it was kind of a yellowish green when it came out of the seed. As the late June sun came out, this plant that I have named Basil, started to show a will to live. Basil lives in a nice sunny corner of my house in a planter next to a couple of cherry tomato plants and another basil plant that has always done well. Just for kicks, I'm going to document Basil's growth online with your encouragement through the comment section of this page. 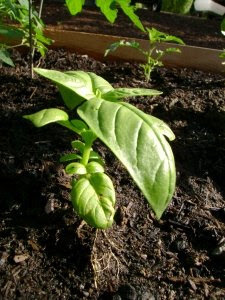 You'll get to see a time lapse cycle of the life of a simple garden herb. But don't get too attached, I plan on turning Basil into pesto at the end of the summer. Stay tuned for photo updates. Your Basil is much more photogenic than ours. :>) Can't wait to watch him achieve tasty maturity. Hmmm, I have a sudden craving for either bruschetta or a nice capreses salad . . .
We have two basil varieties that look a bit eaten round the edges. The oregano and especially the thyme put them to shame. From time-to-time, I check out your site. You do a nice job. However, I have one question: As I try to exit the site, to return to ORBlogs, it will not allow the return. Instead, just stays at your site, almost as though there's something goin' on. Any info would be appreciated. I'd hate to stop visiting. If anyone else has this issue let me know. I noticed it happening in Internet Explorer. I use Mozilla Firefox so I've never scene this issue before. I used to experience the same thing , until I tried to get in the habit of clicking on the "back" arrow and specifying which page I wanted to return to. BUT it hasn't happened since we upgraded to Firefox 3. Nice basil garden. Look at my thai and purple basil too. Easy to grow in our climate.